The Mendi Music Trio is a dynamic and powerful sound of musical cultures from around the world merging together in harmony to create a universal sound. Lead by tabla maestro Mendi. 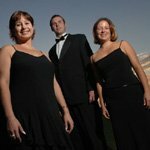 The trio was formed over 10 years ago, performing at festivals, public concerts, corporate gatherings and celebration events. A unique and mesmerizing act, The Mendi Music Trio is an ideal act for those looking to add a difference touch to their event. Apart from performing as a Trio, they are also available as a Tabla Soloist or a Tabla & Harp Duo, upon request.